The Mahindra XUV300 will launch on 14 February and become a direct rival to the Maruti Vitara Brezza and Tata Nexon. Ahead of the sub-4-metre model's market debut, AutoPunditz has leaked the specifications table. The Mahindra XUV300 is expected to cost INR 8-12 lakh (ex-showroom). At this price point, it will go on to rival the likes of Maruti Vitara Brezza and even the entry- and mid-level versions of the Nissan Kicks and the Hyundai Creta. The Mahindra XUV300 will be available in two turbocharged engine variants - 1.2-litre petrol and 1.5-litre diesel. The former outputs a maximum power of 81 kW (110 bhp) at 5,000 rpm and a peak torque of 200 Nm from 2,000-3,500 rpm, while the latter produces a maximum power of 85.8 kW (115 bhp) at 3,750 rpm and a peak torque of 300 Nm from 1,500-2,500 rpm. Both the motors come mated to a six-speed manual transmission. 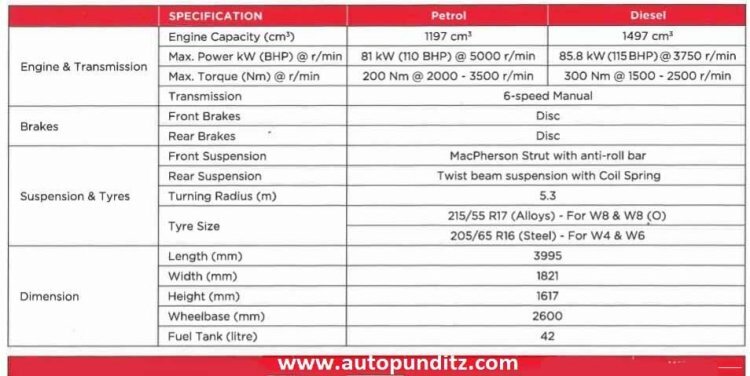 All the versions of the Mahindra XUV300 feature disc brakes on all wheels. The new compact SUV features MacPherson Strut with anti-roll bar at front and Twist beam suspension with coil springs at the rear. It is underpinned by the Ssangyong Tivoli's X100 platform that should help the new SUV achieve a high safety rating. The W4 and W6 trims, which will feature 16-inch steel wheels, will come with 205/65-spec tires. The high-end W8 and W8(O) grades get 17-inch alloy wheels shod with 215/55-spec rubber. The Mahindra XUV300 looks set to become the most feature-laden option in its segment. The top-spec W8(O) grade will come with a list of high-end features, including auto-dimming IRVM, heater ORVMs, dual-zone climate control, front and rear parking sensors, seven airbags, Tire Pressure Monitoring System (TPMS), and electric sunroof. All variants will be available with Dual front airbags, Audio system with four speakers, ABS and EBD, ISOFIX, Electrically adjustable ORVMs, Electric tailgate release, and Multiple steering settings. The top-spec Mahindra XUV300 will offer several segment-first features, including seven airbags, front parking sensors and dual-zone climate control. The Mahindra XUV300 will measure 3,995 mm in length, 1,821 mm in width, and 1,617 mm in height. In comparison, the Maruti Vitara Brezza, Ford EcoSport, and Tata Nexon are 1,790 mm, 1,765 mm, and 1,811 mm wide, respectively. The new SUV will offer a ground clearance of 180 mm, along with a boot space of 265-litre. It will deliver a fuel efficiency of 17 km/l with the petrol engine and 20 km/l with the diesel engine.